JUST when everyone thought the dust had settled, the furor over the making of The Damnation Of Harvey McHugh has hotted up again. 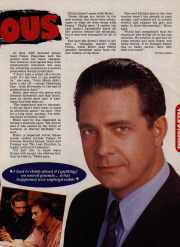 The new outbreak was started by Philip Quast, who plays the Minister in the 13-part ABC series, and who is the first cast member to speak out about what he calls "a scandalous waste of public money". In reaction to his comments, AFI award-winning writer John Misto has revealed his experience on the show was so traumatic, he won't work in television in the near future. And new producer Sue Masters says she had an uphill battle to lift morale on set after the firing of first producer Denny Lawrence. Speaking from England, where he is touring with the stage production St Joan, Philip says he considered quitting Harvey McHugh when Lawrence was fired and the six episodes already made were thrown out. "I had to think about it on moral grounds," he says, "because I thought what happened was unforgivable. I think it was very unfair what happened to Denny, because that sort of thing can destroy someone's career." Sue, who is also head of drama for the ABC in Victoria, denies the decision will adversely affect Lawrence's career. "I believe Denny is such a significant talent in this country that he will go on to other things and there will be no repercussions," Sue says. "Yes, it is sad what happened, and it was difficult for me coming into a situation where the previous producer was fired. I felt very sad for Denny that his version of this show was not what the ABC wanted. "The ABC made the decision to remake the series. It was a brave decision and it has subsequently been proved to be a correct one." One of Philip's main criticisms is that in reshooting the six episodes already completed, the series cost much more to make than it should have. 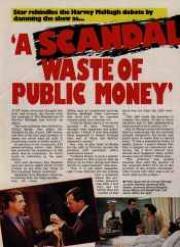 "It was a scandalous waste of public money. I expect things like this to happen on commercial networks, but I don't believe they should have happened when public money was involved," Philip says. "The producer was sacked because they said the quality of the program didn't live up to the promise of the scripts. Ironically, after Denny left there was a lot of work done on the scripts." At first, ABC national drama head Penny Chapman said the scripts were not being changed. Sue, however, now agrees they were substantially reworked, but says the rewriting occurred as a normal progression during production. "I don't take a script off a writer until it's the best it can possibly be," she says. "John Misto didn't have a day off - except Christmas Day - from November to the end of production in April." Misto, who wrote the series with Graham Koetsveld and Ray Kolle, says he would have quit if Lawrence had been kept on. "The experience was so traumatic for me that I don't want to work in television again," he says. "Not for a long time, anyway. I'm writing plays in Sydney now." Misto says he was diagnosed as having a stomach ulcer. "My doctor said it was caused by the worry of working on Harvey McHugh," he says. Misto, a respected writer whose screen credits include Palace Of Dreams, Natural Causes, Peter And Pompey and The Last Frontier, is highly critical of Lawrence. "I'd just like to know when Denny will accept the obvious fact that he blew it," Misto says. Philip doesn't agree with Misto. "Some things are better in the new version, but there were advantages to what we were doing with Denny," Philip says. "I realise the cast doesn't necessarily know all the politics behind the situation, but it was very traumatic for all of us." Sue says she doesn't want to get into a "slanging match" with Philip, while Misto says Philip actually benefited most from the new version of the show. "Sue said Philip's part in the first version wasn't big enough or good enough, and ordered me to totally rewrite and enlarge his part and make it three-dimensional," Misto says. "Philip had complained that his character was falling off in the last episodes. We rewrote it and now he turns around and says Denny was badly served. If he thought Denny was so badly served, then why didn't he leave?" We would like to thank Elizabeth for providing us with this article. © Kate McCullugh & Angela Pollard 2001. No portion of this page may be copied without permission of the author.